Sharing positive recommendations from satisfied customers of your products or services is one of the best ways to attract new customers. 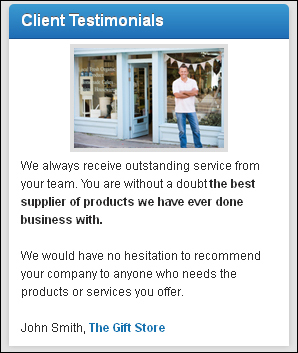 Testimonials provide social proof that your business can deliver great value and service to customers. 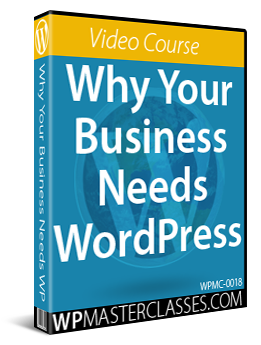 It is also a powerful and inexpensive marketing resource that can help boost your business credibility and improve sales conversions. Sometimes, a great testimonial is all it takes to convince someone to choose your business over someone else’s. In this tutorial, you will learn how to create a ‘Testimonials’ page and how to add rotating testimonials to your site using WordPress testimonial plugins. If you’re not displaying testimonials from customers on your site, you’re missing out on great opportunities to attract more customers and make more sales. The first step is to create and add a testimonials page to your site. After creating your ‘Testimonials’ page, the next step is to add testimonials to this page. 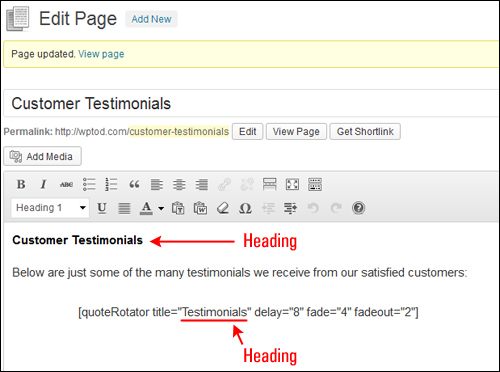 In the above example, the testimonials were formatted using the blockquote feature of the WordPress content editor. 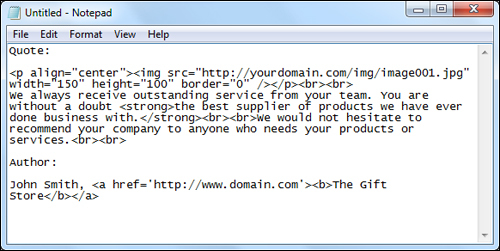 Adding testimonials manually to your ‘Testimonials’ page is fine, but if you really want to get the most benefit out of using testimonials on your site, we recommend using the other methods shown below. If you use a versatile WordPress theme like Avada, for example, you can add testimonials to your site using the theme’s built-in page builder. Avada uses drag and drop page-building elements to add special features to your pages, like testimonials, sliders, pricing tables, videos, maps, widgets, etc. 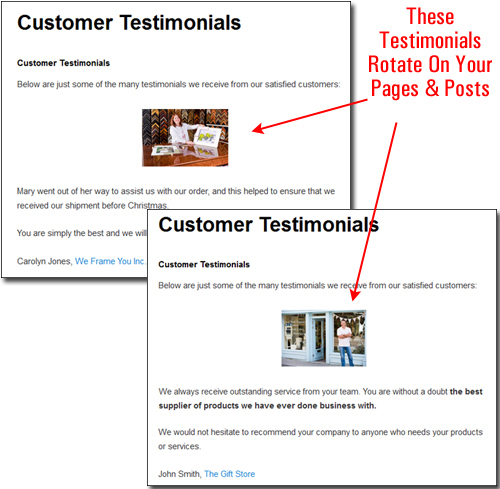 This method is useful for displaying rotating testimonials in different sections of your website (see next section below). Many banner ad plugins let you insert ‘text’ ads into your posts and pages, so you can set up ad groups using testimonials instead of text ads. You can do this using plugins, shortcodes, banner ads, etc. 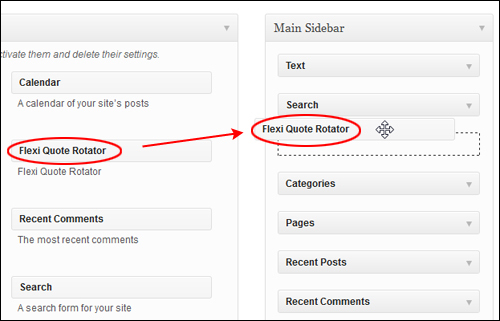 Flexi Quote Rotator provides an easy and simple way to add and manage content, images, and links to your site. 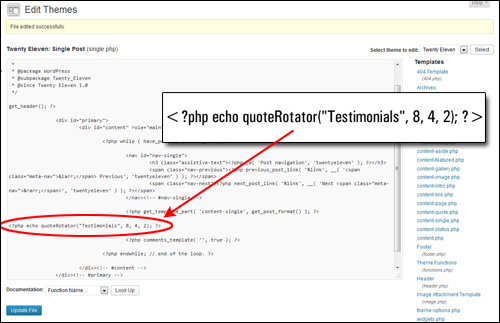 The plugin lets you add quotations and testimonials to your site using shortcodes and PHP snippets in theme templates, as well as a widget. 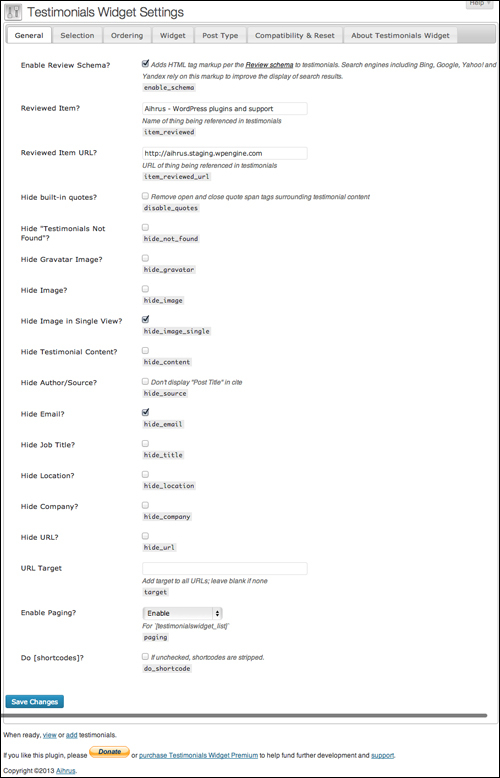 The plugin also adds a settings panel to your site’s admin area and provides additional styling flexibility. 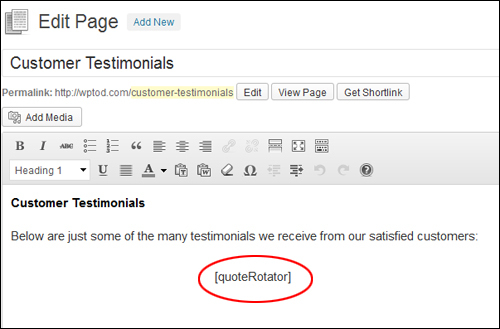 You can use this plugin to display quotations or testimonials, or other rotating snippets of content on your web site. 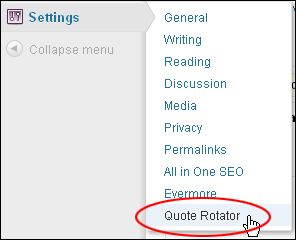 Quotations and testimonials will rotate with a fade transition on each changeover. Title: This adds a header above the quote area. Leave this field blank if you don’t want to display a header. Delay (in seconds): Enter the rotational delay time in seconds (the time each quotation displays on your site before it is replaced by the next item). 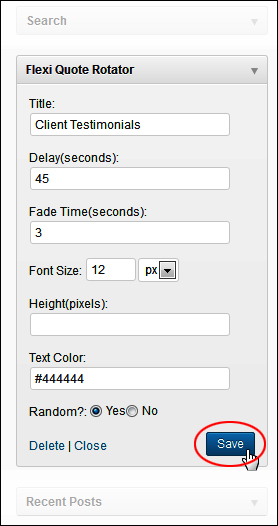 Fade in duration (in seconds): Enter the number of seconds for your quotation fade-ins. 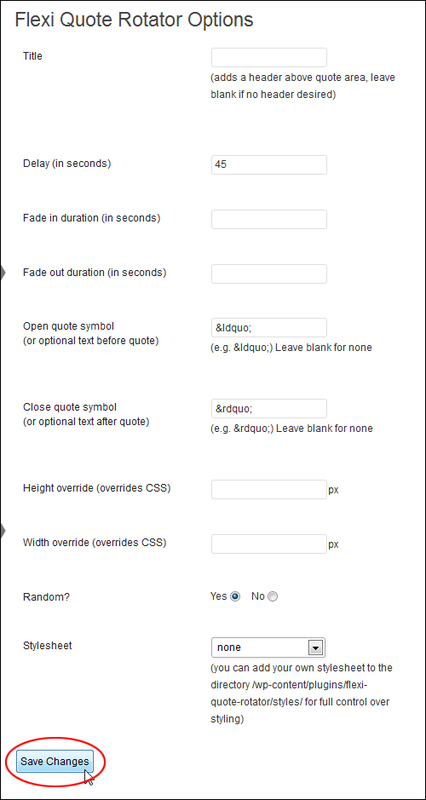 Fade out duration (in seconds): Enter the number of seconds for your quotation fade-outs. Open Quote Symbol: Enter an open quote symbol (e.g. &ldquo;), or an optional text you would like to display before the quote (e.g. Unsolicited Testimonial:). Leave this field blank to display no symbols or optional text. Close Quote Symbol: Enter a closed quote symbol (e.g. &rdquo;), or an optional text you would like to display after the quote (e.g. – Product Name). Leave this field blank to display no symbols or optional text. Height override (overrides CSS): Enter a height in pixels if you want to override the default height set by the plugin’s stylesheet. Width override (overrides CSS): Enter a width in pixels if you want to override the default height set by the plugin’s stylesheet. Random? Select whether to display your entries in random or sequential order. Stylesheet: You can select one of the plugin’s preset stylesheets from the drop-down menu or add your own stylesheet (see below). A few example stylesheets are included in the styles folder (/wp-content/plugins/flexi-quote-rotator/styles/). These stylesheets can be selected in the settings admin panel, then copied and modified to create a new look, and saved in the styles folder where it will become available for selection in the settings admin panel. 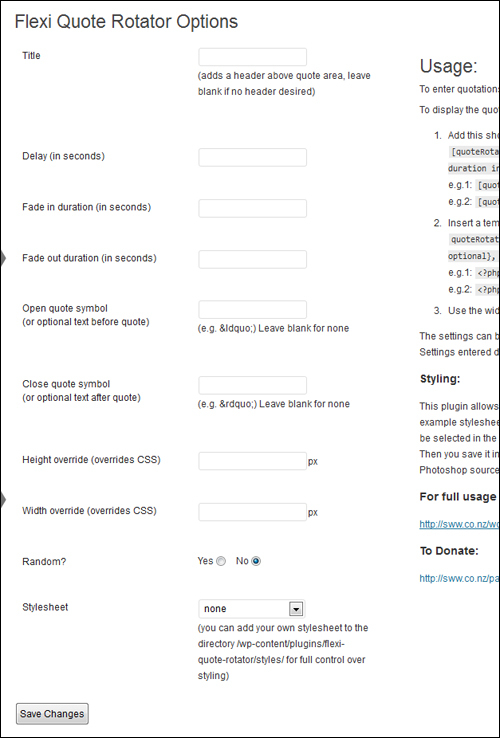 You can also modify the plugin’s Photoshop source file background images. 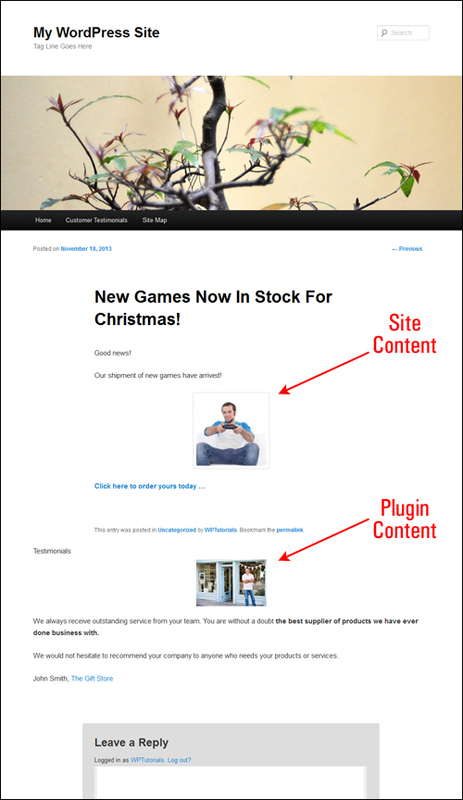 After adding quotations or testimonials, the next step is to display these on your site. 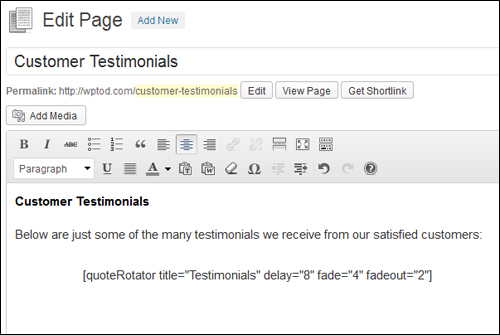 You can insert testimonials or quotations anywhere in your post or page content using a shortcode. Settings entered directly into the shortcode override the settings saved in the plugin administration settings. A little planning, therefore, is required when adding content in order to avoid displaying repeating titles and headings on your site’s pages. For example, if you are going to add a section of text to your page that contains a heading (e.g. “Customer Testimonials”), then leave the title out of the shortcode. If you are using the widget then edit settings in the widget. Adjust the settings until you are happy with the length of duration, fade ins, fade outs, etc. The Delay in seconds entered into the widget settings must be the same as the Delay time you entered into the Flexi Quote Rotator Options settings screen. If you find that your content is rotating too quickly, check the Delay settings in the widget and the settings screen to make sure that they match (i.e. same value entered into both fields). 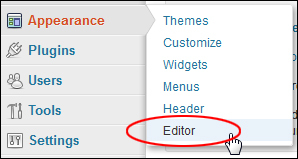 This option requires some knowledge of adding and editing PHP code in your WordPress template files. Always backup your site before making changes to your files, and if you are not comfortable editing code, ask a professional for help. This option is useful if you want to customize your WordPress site to display testimonials on all pages or posts throughout your site, or areas of your site other than your sidebar menu (use the widget for displaying testimonials on all posts via your sidebar). Note: Settings entered into the PHP template tag override the settings saved in the plugin administration settings. Thrive Ovation is a complete all in one, “set & forget” testimonials management plugin for WordPress. 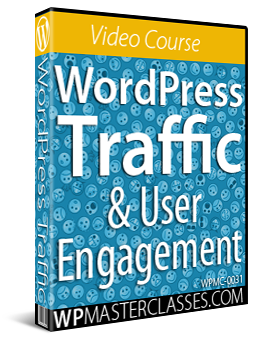 It allows you to transform comments left on your WordPress site into testimonials with one-click, integrates with Facebook and Twitter to help you leverage the power of social testimonials, and lets you collect testimonials on auto-pilot. Insert testimonials anywhere you like using shortcodes. 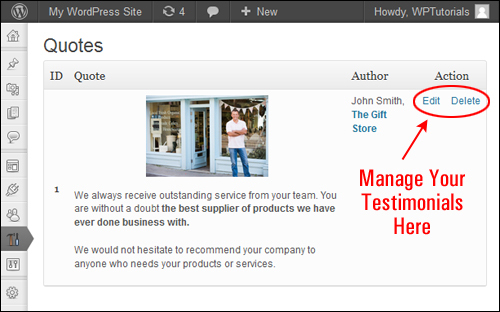 Testimonials update throughout your site dynamically from one central location. 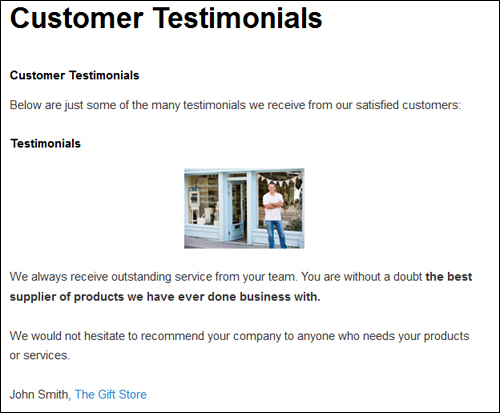 Includes a library of fully customizable, professionally designed testimonial templates. You can insert Testimonials Widget content via shortcodes, theme functions, or widgets with category and tag selections and choose multiple display options such as random or specific ordering. 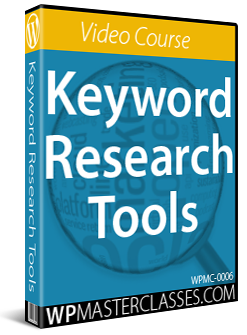 The plugin also features a built-in review schema for improved search engine results. Slide Mixed Content: slideshow having video slides, images slides, and text slides. Each individual slide can also have mixed content. Shortcode compatible – slide content that is rendered using shortcodes. i.e. 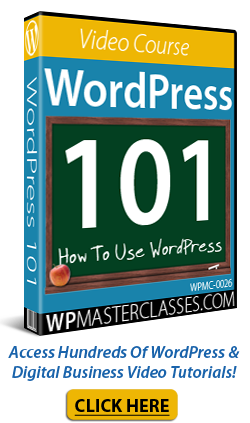 stock WordPress Galleries and Gravity Forms. Filter slideshow content by WordPress’ built-in categories, tags, or post-ID. The Testimonial Widgets plugin also has an incredible array of features, including custom styling and categorical display. Through categories and tagging, you can create organizational structures based upon products, projects and services via categories and then apply tagging for further classification. As an example, you might create a Portfolio category and then use tags to identify web, magazine, media, public, enterprise niches. 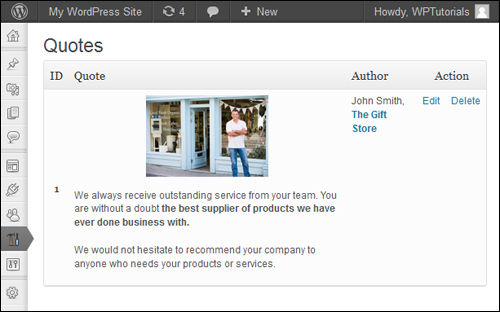 You can then configure the Testimonial Widget to show only Portfolio testimonials with the public and enterprise tags. 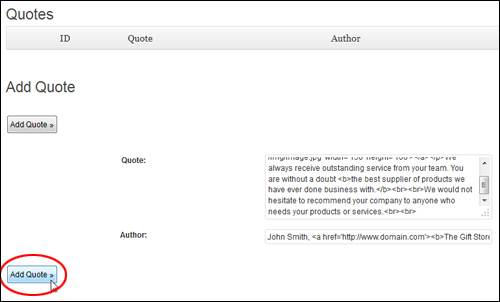 In another Testimonial Widget, you can also select only Portfolio testimonials, but then allow web and media tags. The single testimonial view supports image, source, title, location, email, company and URL details. 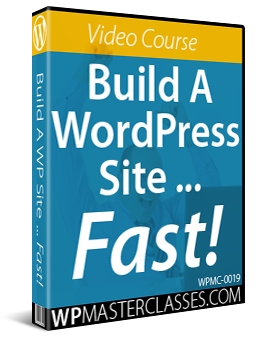 Additionally, you can upgrade to the Premium version, and access additional features like caching, excerpts, filters, read more links, more selection options, and advanced capabilities like using custom post types as testimonials. The Premium version also supports ratings and users can submit their own testimonials via a front-end form shortcode or widget. 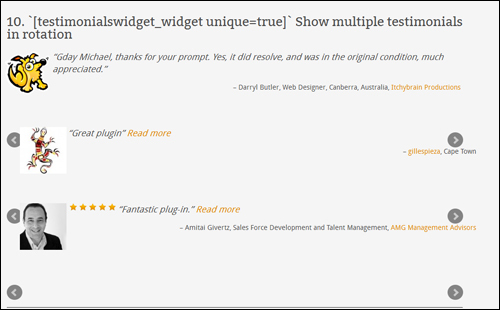 If you are looking for a feature-rich testimonials plugin for WordPress that gives you complete control over the management and display of your testimonials, then consider using the Testimonials Widget plugin. 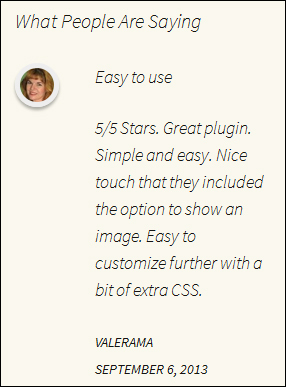 Easy Testimonials is an easy-to-use plugin that allows users to add testimonials to the sidebar, as a widget, or to embed them into a Page or Post using a shortcode. 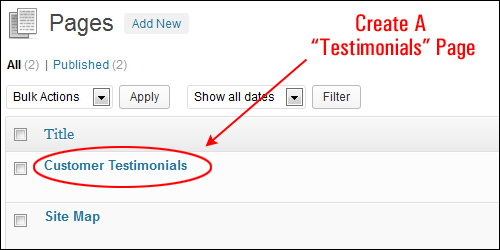 Easily manage, edit, create, and delete testimonials on your site. Set a “read more” URL to direct visitors to a product info page. The plugin inherits the styling of your theme, so no customization is required. 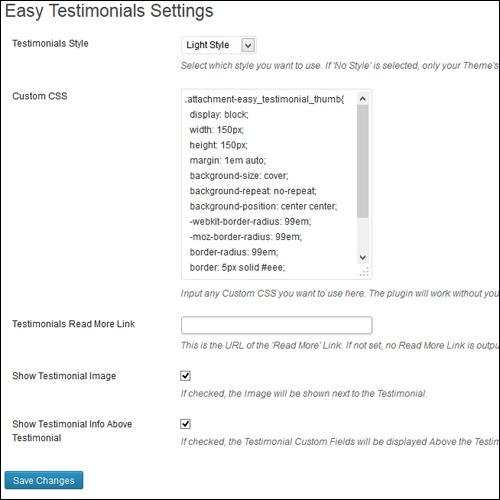 Testimonials Showcase is a premium WordPress plugin that lets you easily edit, manage, and display testimonials on your WordPress site with just a few simple clicks. 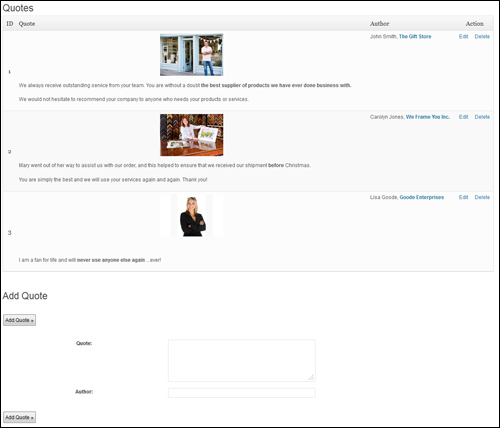 This plugin lets you display testimonials from your clients, reviews of your product or service, a list of quotes, and link case studies. This plugin helps you easily manage the adding, editing, and deleting of testimonials on your WordPress site. Responsive design that resizes for correct display on any device or browser. Styling options (display image on top, bottom, or side of the testimonial, display testimonial in a speech bubble, customized font and background colors, font types and more. Congratulations! 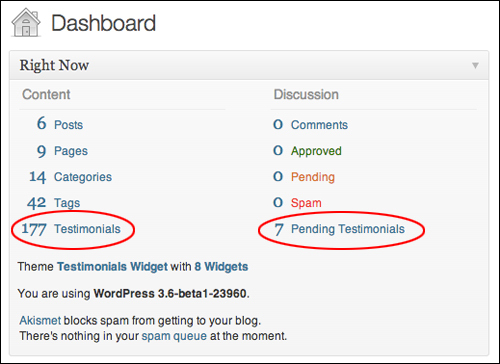 Now you know how to add testimonials to WordPress.